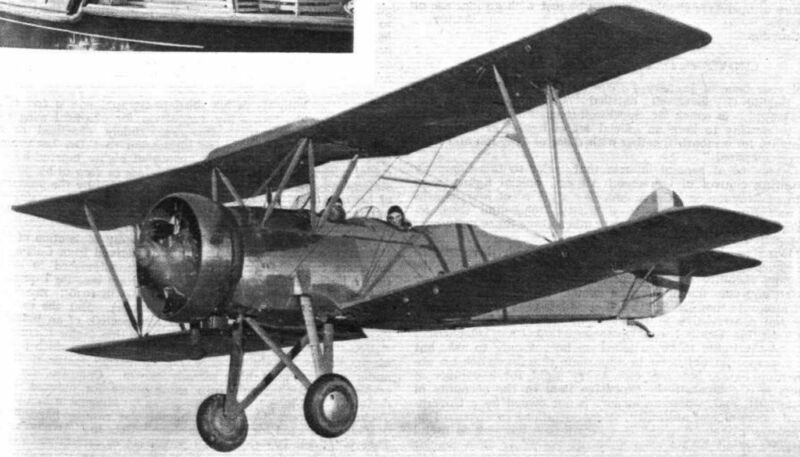 HOT FROM HOLLYWOOD: The modified Hughes Special (Pratt and Whitney Twin Wasp Junior) in which Mr. Howard Hughes flew from Los Angeles to Newark, New Jersey, at an average speed of 332 m.p.h. 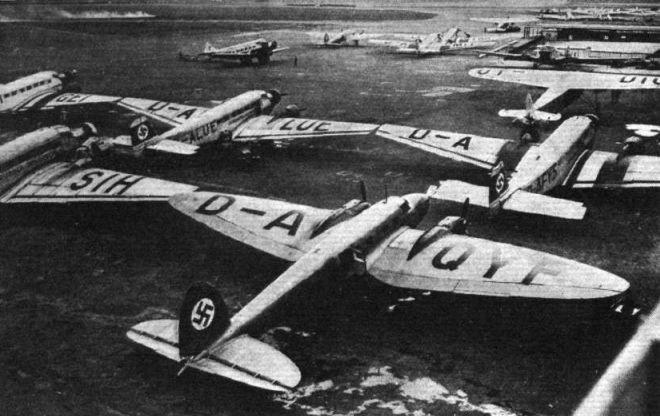 This single-seater dive bomber, the Henschel 123, is now in production for the German Air Force with a B.M.W. Hornet nine-cylinder air-cooled radial. It has a top speed of 220 m.p.h. 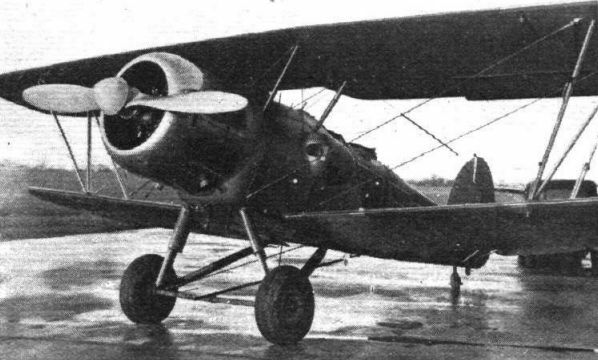 The Henschel single-seater fighter and dive bomber. Between the undercarriage legs is an auxiliary fuel tank. Signalling-out an He.111 with an indicator of the type used on railways. Note the official's armament. 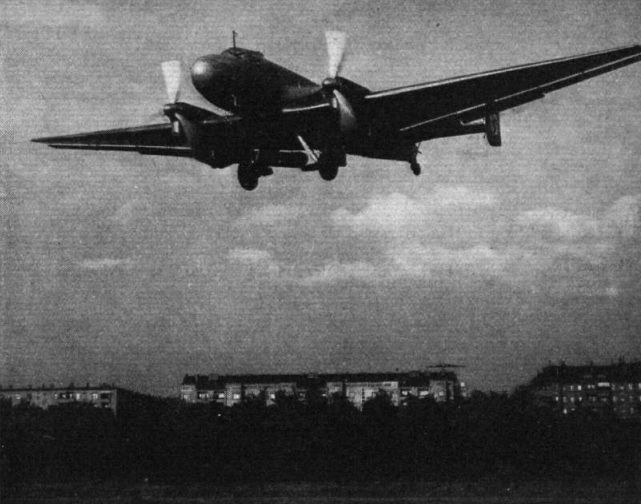 A closeup of the ten-passenger He 111. The engines are B.M.W. 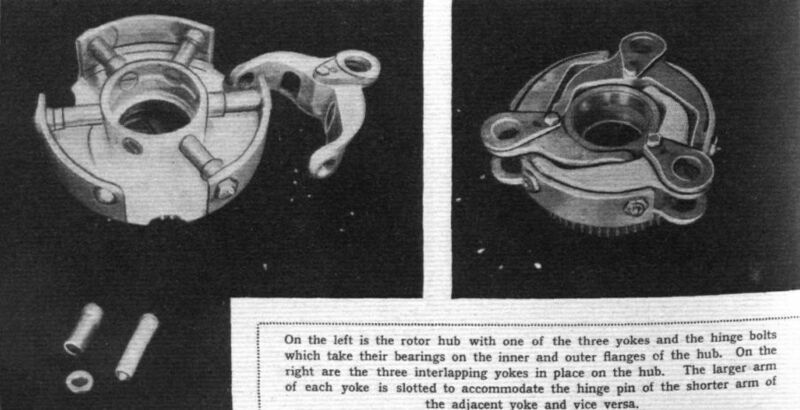 vee-twelves of either 660 or 880 h.p. REALISM in flying scale models: Three prize-winners in the senior section of the constructional competition recently held by Hamlays, of Regent Street, London. Trophies were presented by Major C. J . Galpin, D.S.O., Deputy Director of Civil Aviation. 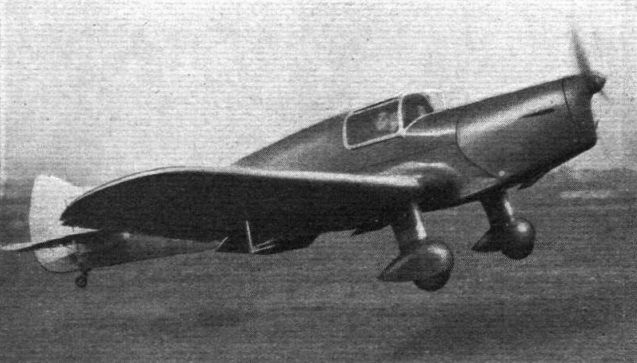 The Bristol Fighter (third prize) by Mr. H. J. Pomeroy. 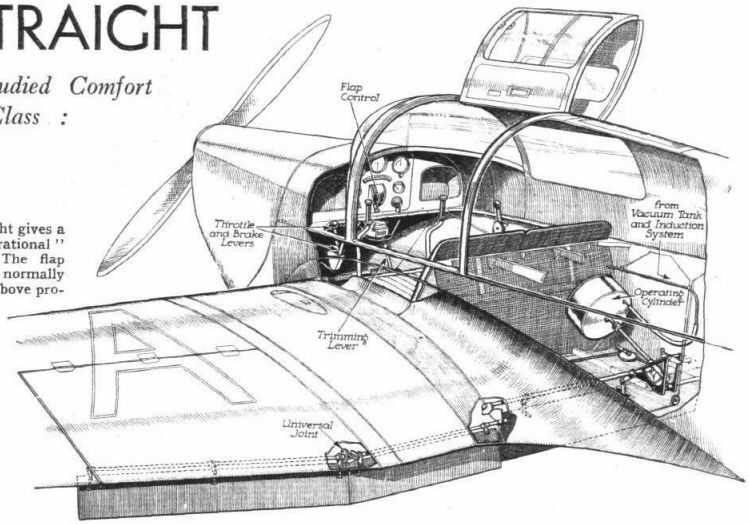 These general arrangement drawings of the Ensign class monoplanes being built for Imperial Airways by Armstrong Whitworths bring out some striking design features. The span is 123 ft., length 110 ft., and wing area 2,450 sq. 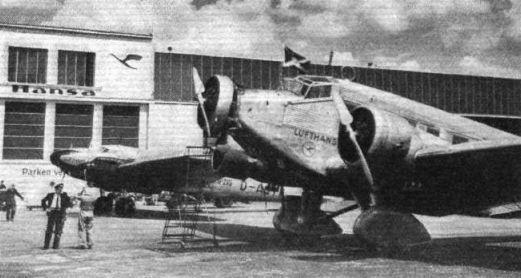 ft.
A Martin bomber (two 800, h.p. 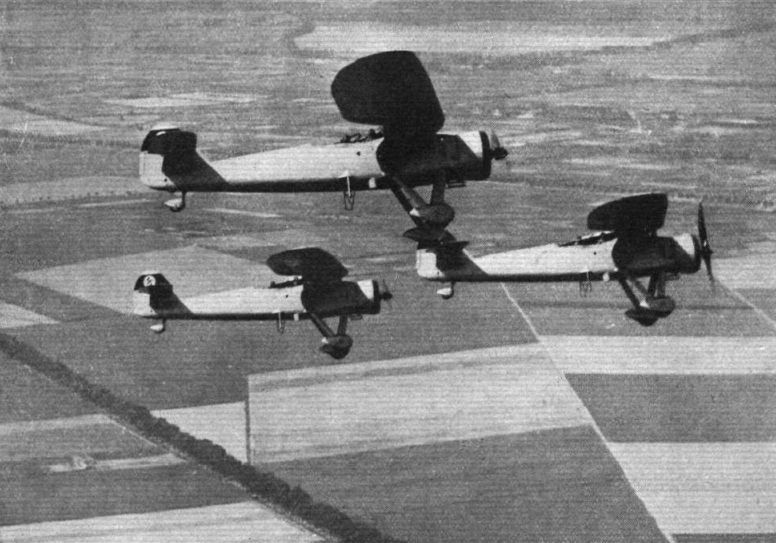 Wright Cyclones) supplied to the Dutch Government for service in the East Indies. The maximum speed is in the region of 230 m.p.h. BASKING SHARKS: Egyptian sunlight lends a particular charm to this view of Blackburn Shark T.S.R.s (Siddeley Tiger VI engine) from H.M.S. 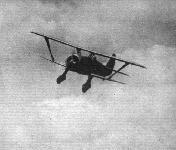 Courageous over Aboukir, the coastal town and R.A.F. base near Alexandria. 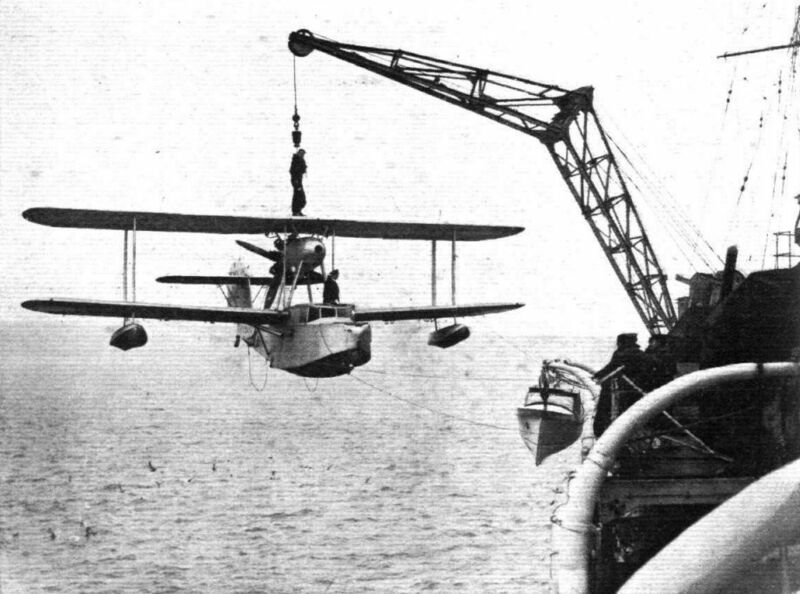 A WALRUS HOOKED: Hoisting a Supermarine Walrus on board H.M.S. Devonshire in the Mediterranean. This ubiquitous amphibian - the engine of which is a Bristol Pegasus - can accommodate itself to a catapult, to an aircraft carrier's deck, to the surface of the sea, or to dry land. Incidentally, there is no truth in rumours - which this rather sinister picture might suggest - of new punishments for Fleet Air Arm pilots. 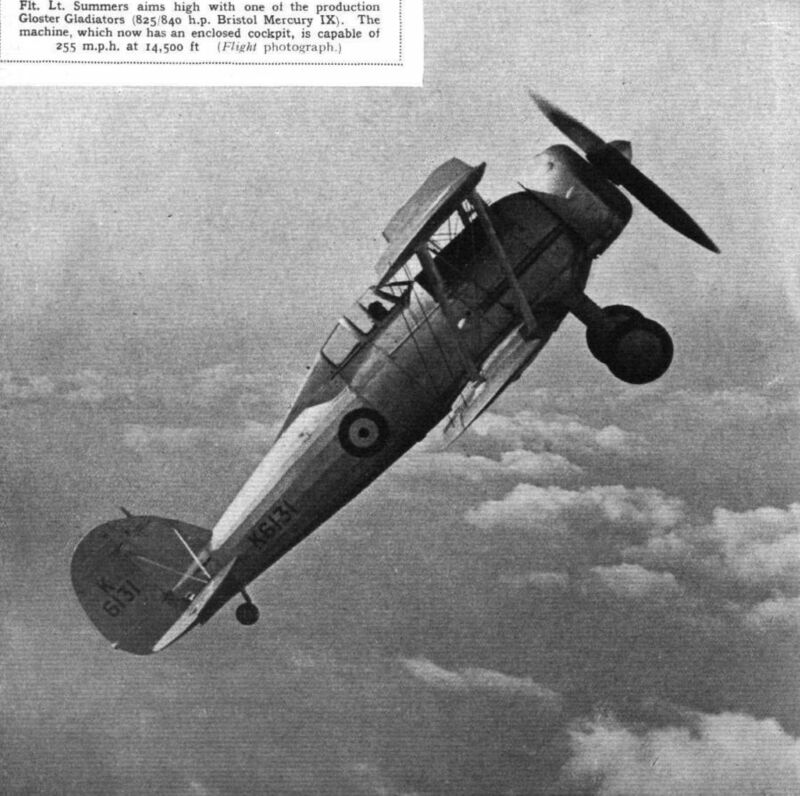 FOR DIVERS DUTIES: A versatile new Blackburn aeroplane ordered in quantity for the Fleet Air Arm: the fleet-fighter dive-bomber monoplane with 825/840 h.p. Bristol Mercury engine. The arrangement of the tail unit is perhaps the most striking feature of this noteworthy machine, which is seen here in a not-quite-finished state. 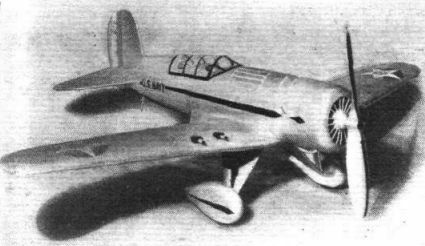 NAUTICAL NEOPHYTE: The first monoplane to be ordered for F.A.A. 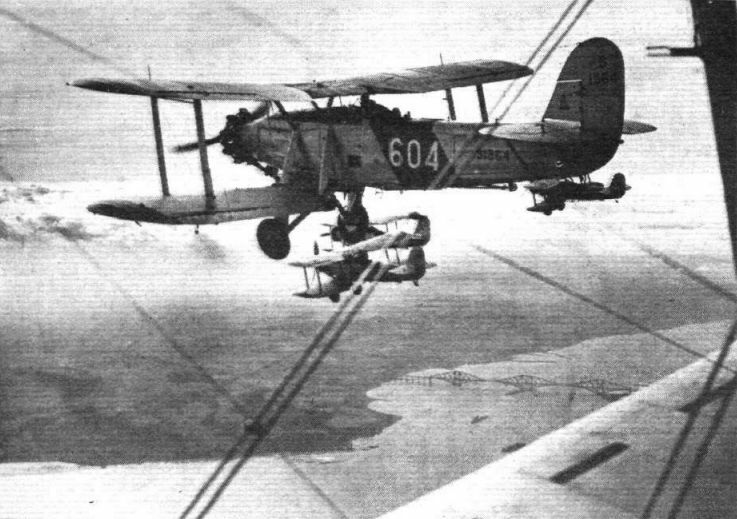 equipment, the new Blackburn incorporates such modern aids to pertormance as flaps, D.H. v.p. 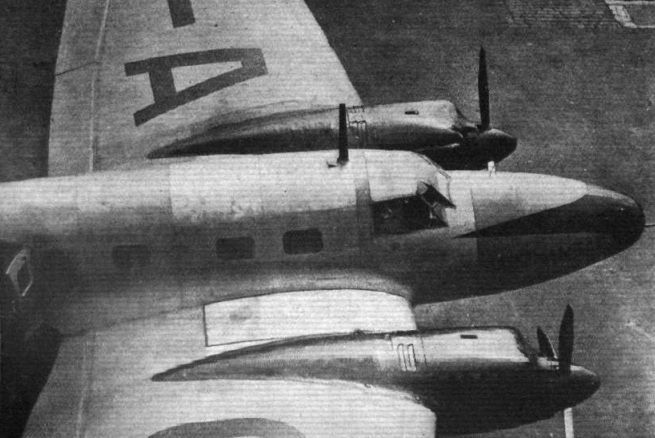 airscrew and retractable undercarriage. The engine in the prototype is an 825/840 h.p. Bristol Mercury which may be replaced by a sleeve-valve Perseus. 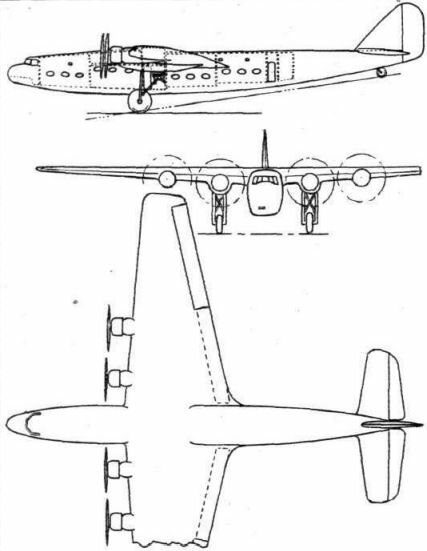 HIGH-DIVER: The new Blackburn dive-bomber fleet-fighter, the tail of which should be compared with that of the Vultee; the relative positions of rudder and tailplane are transposed. 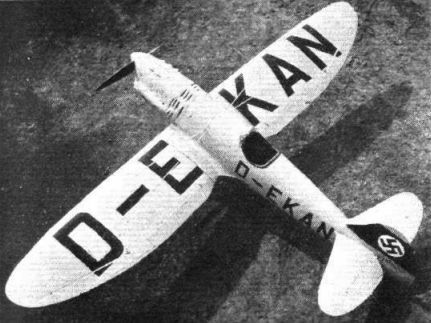 The Focke-Wulf F.W.58 has a wide sphere of usefulness as a military trainer, its scope including gunnery, bombing, blind-flying and general twin-engine tuition. 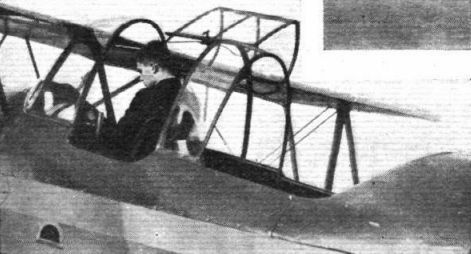 LIGHTWEIGHT: The latest Belgian version of the Tipsy monoplane, complete with enclosed cabin which has, it appears, slightly raised the maximum speed. 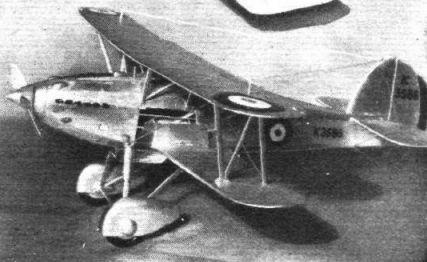 The Avro 626 Training Biplane (277 h.p. 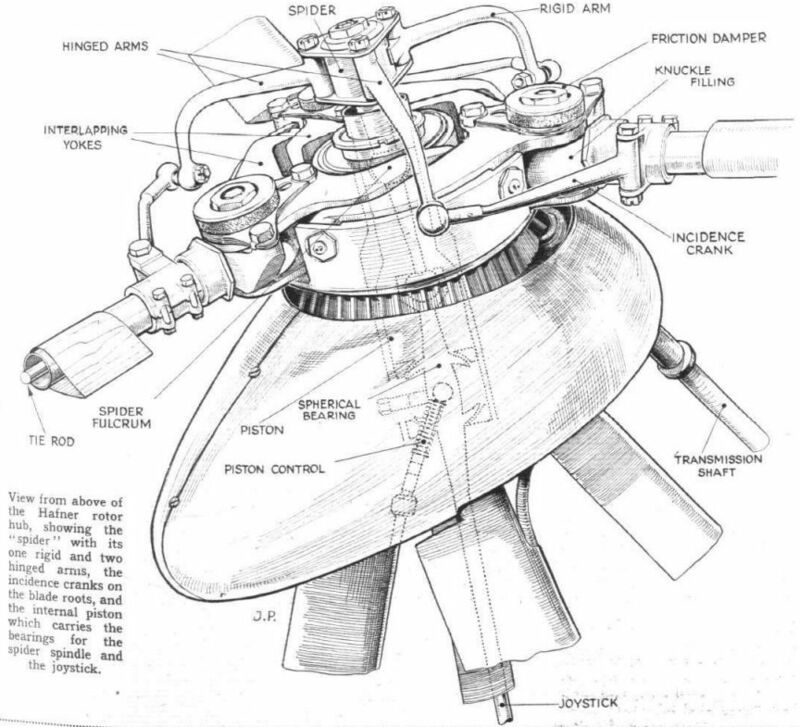 Armstrong Siddeley "Cheetah V" engine) as supplied to the Brazillian Government. An Avro 626 (275 h.p. 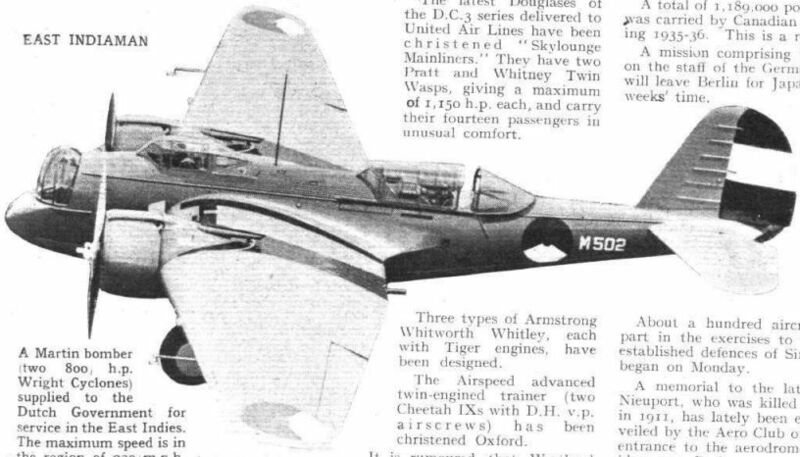 Armstrong Siddeley Cheetah V) trainer for Brazil. 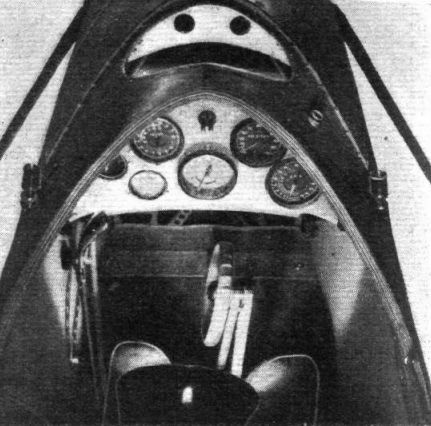 It can be used for a variety of purposes, the rear cockpit being adaptable for gunnery, prone bombing, photography or radio, while provision is made for instrument flying and message collection. In the front seat is Mr. H. A. 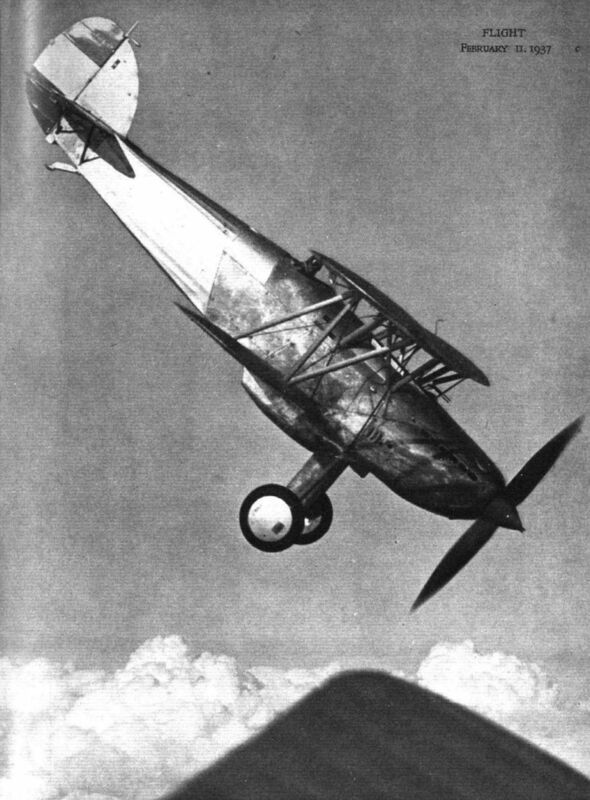 Brown (Avro chief test pilot), and the passenger is Sefior Polzin, Brazilian Vice-Consul. 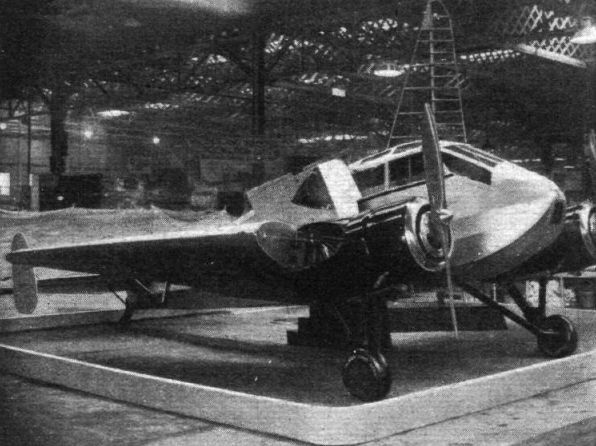 One of two complete aircraft at Castle Bromwich - the De Luxe Monospar shown by General Aircraft Ltd. Behind the machine is an uncovered wing. The other make exhibited is an Aeronca. CENTAURUS SETS OUT: Loading up at Hythe, Southampton, for the inaugural Empire service. 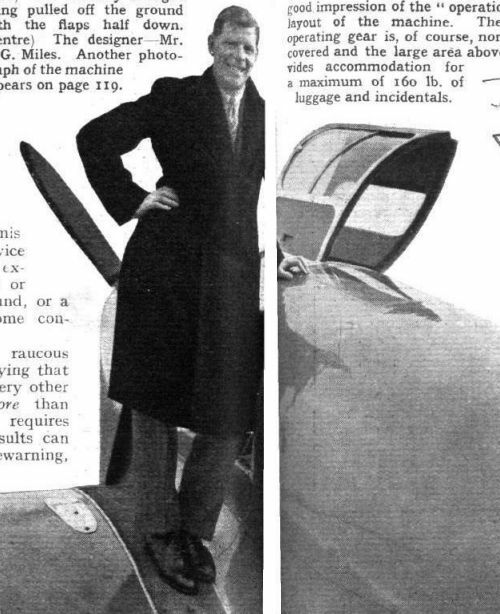 Passengers are boarding the machine from one of Imperial Airways' new 37ft. 6in. tenders, supplied by the British Power Boat Company The photograph, incidentally, gives an interesting close-up of the flying boat's wing, with its flap. IN BERMUDA: This somewhat unusual picture shows how Cavalier's hull was towed from the naval dockyard to the Darren's Island base, where the machine is being assembled. The floats on either side are, of course, quite temporary affairs. LONG-RANGE EXPERIMENT: Following Caledonia's non-stop flight from Southampton to Alexandria, the second long-range Short boat, Cambria, made a circuit of Britain last Sunday. 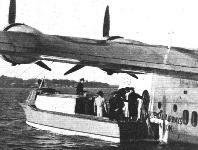 This photograph shows Cambria being moored off Hythe at the end of the flight, with the liner Westernland in the background. 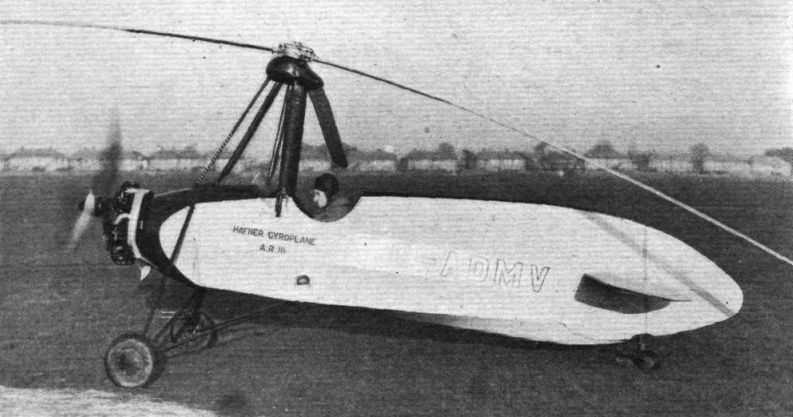 CIRRUS ENGINED: In its latest form the Wicko monoplane is fitted with a 90 h.p. Cirrus Minor engine and flaps. The cruising and maximum speeds are now 105 and 120 m.p.h. 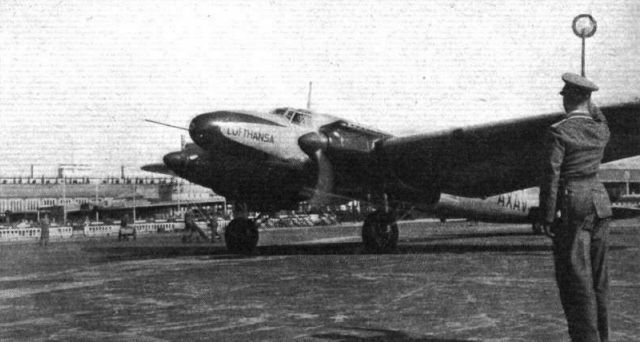 respectively, and the cruising range is 450 miles with two occupants and baggage, A batch of six machines are now going through, and new premises have been taken over at Southampton airport. 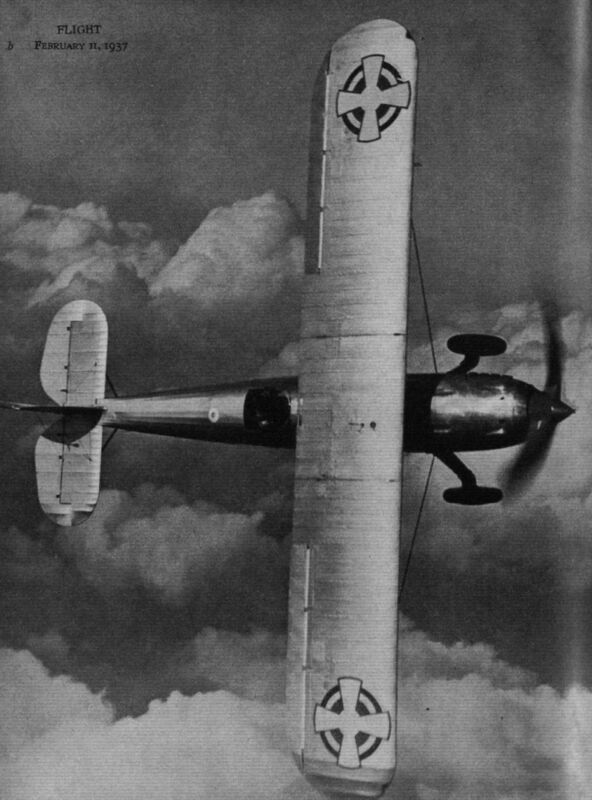 DOUBLY DEADLY: The two-seater fighter is a type well represented in the world's air forces. Holland's newest is the Koolhoven F.K. 52 with one of our own Bristol Mercurys of 830 h.p. maximum. The cantilever undercarriage is reminiscent of the Gladiator. At 14,400 feet the new Koolhoven does about 230 m.p.h. An interesting cockpit enclosure has been evolved, the rear portion housing a special Koolhoven machine gun mounting. PLEASING LINES: This, the latest product of the Koolhoven Company in Holland, is the F.K. 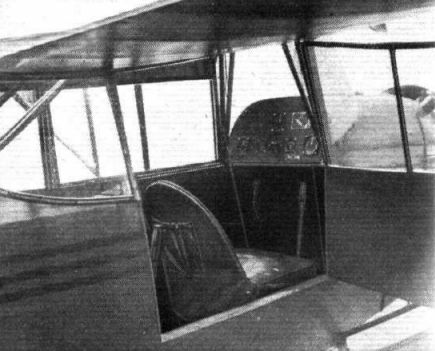 53 cabin two-seater. 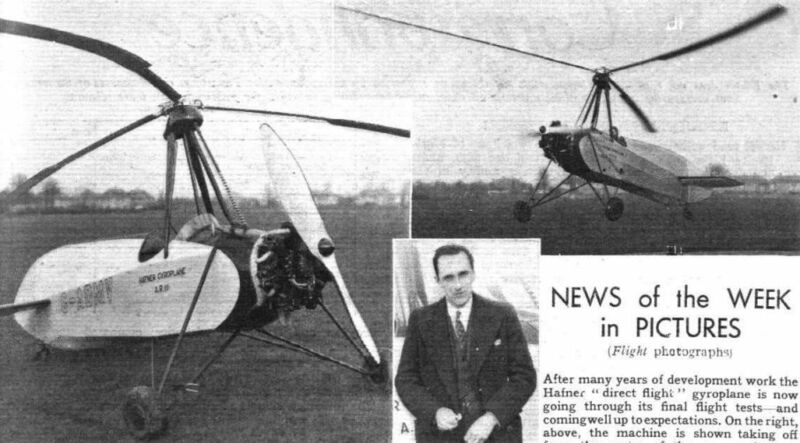 It is powered with a Walter Micron engine of 50 h.p. - a unit comparable with our own Weir engine, which should soon be in production. 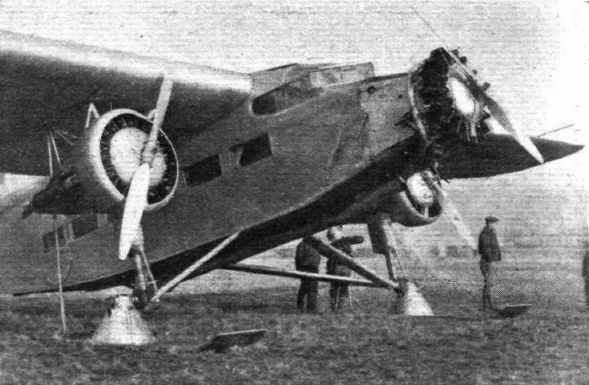 The Whitney Straight being pulled off the ground with the flaps half down. IN CRUISING TRIM: At 2,100 r.p.m. the Miles Whitney Straight cruises at 130 m.p.h. The degree of vertical movement in the undercarriage can be gathered from the amount of the unpainted portion visible in the fairing on the port leg. 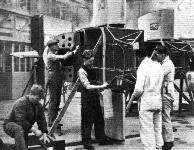 The compact installation of the 135 h.p. Villiers Maya engine in the Miles Whitney Straight. The hot-or-cold-at-will air intake manifold can be seen in this view, which also shows the admirably short fuel and oil lines. The designer - Mr. F. G. Miles. An interesting feature of the Straight production line at Reading: At one period during erection the machines are laid out on their sides so that undercarriage, flap gear and other details may be more easily installed. The line drawing gives a good impression of the "operational" layout of the machine. The flap operating gear is, of course, normally covered and the large area above provides accommodation for a maximum of 160 lb. of luggage and incidentals. 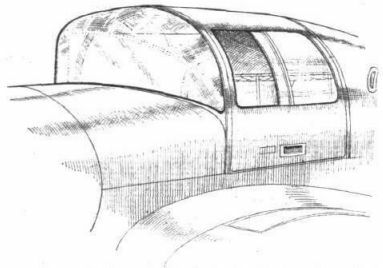 Some idea of the excellent field of view for pilot and passenger, and the clean lines of the one-piece windscreen may be gathered from this sketch. 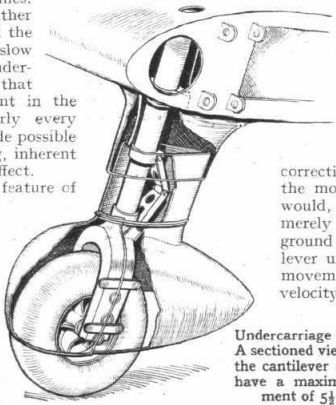 Undercarriage simplicity: A sectioned view of one of the cantilever legs, which have a maximum movement of 5 1/2 inches. 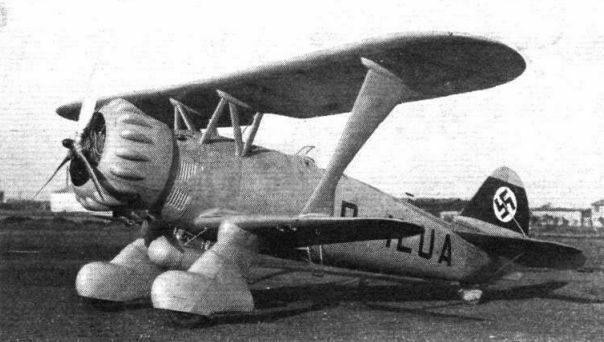 A Savoia S.74 of Ala Littoria. SOURDOUGH: A real old-timer from the frozen wastes of Alaska, this Ford trimotor flew down to Boeing Field complete with skis and made an exemplary landing on the snowless grass. THE PUNY WORKS OF MAN: The Baffin torpedo-bombers of No. 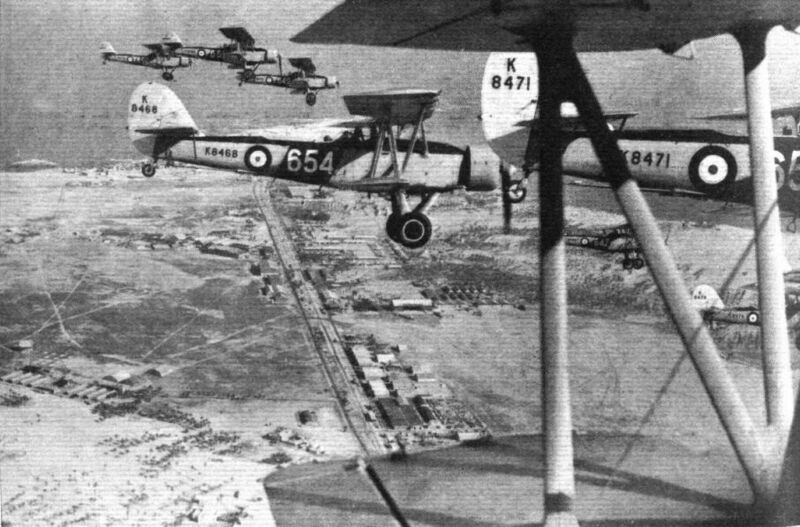 811 Squadron from H.M.S. Furious, look down on the Forth Bridge, the battleship Nelson, and the carrier Courageous. This Flight photograph of the Kitten gives a good idea of its comparatively large size. In this flying picture, the "gull" effect may just be discerned. 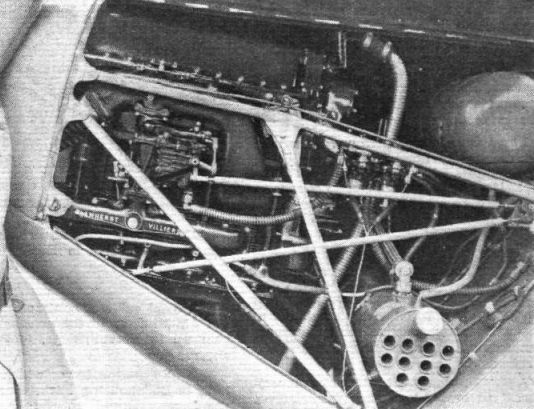 An inverted vee-eight engine is fitted in the Henschel single-seater trainer.